This is fish-and-chips, Korean style. Make it once and you’ll be hooked. I usually make this with Korean beer—Hite and Max are both great brands to look out for. Any kind of beer works well though, as does seltzer. Whisk together the mayonnaise, scallions, kimchi, and kimchi liquid. 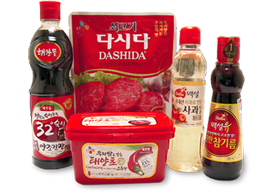 Set the kimchi tartar sauce aside. Whisk together the all-purpose flour, rice flour, red pepper powder, sesame seeds, and salt in a large bowl. Whisk in the egg, fish sauce, and beer. Heat 1 inch of oil in a large, deep skillet over medium-high heat (I like to test the oil by dropping a small piece of torn bread in the oil—it should bubble when you drop it in and begin to get golden brown). 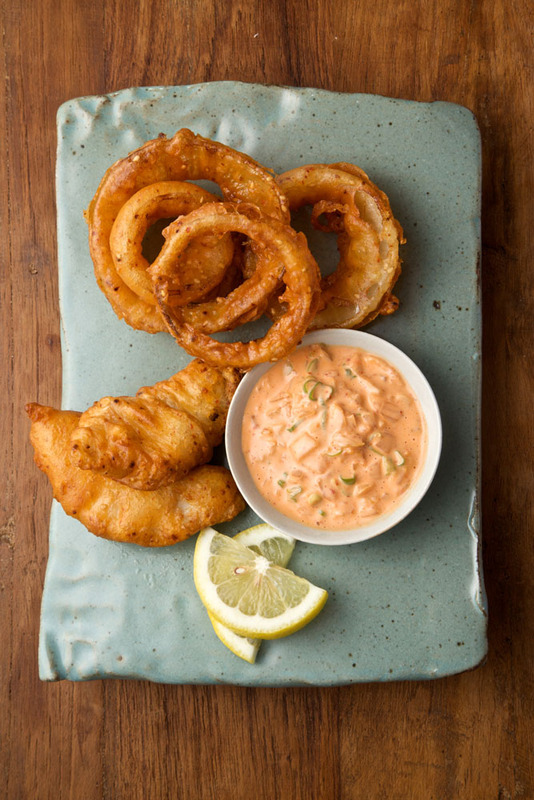 Dip the onion rings into the beer batter just to coat them and carefully place in the hot oil (the onion rings should sizzle on contact). Let them get browned and crispy on the first side, 1 to 2 minutes. Turn the onion rings and let them get browned and crispy on the second side, another 1 to 2 minutes. Drain on a paper towel–lined plate. Place 1 cup of rice powder in a shallow bowl. Dredge the fish the rice flour and then dip into the beer batter. Make sure the oil is still good and hot (reheat if necessary) and fry the fish until browned and crispy, about 2 minutes per side. Drain the fish on a paper towel–lined plate. Serve the fish with a tall pile of onion rings and the reserved kimchi tartar sauce.